Meanwhile, behind the scenes of this discussion ... some correspondence has taken place between LadyOctopus and Mrs. Birdfish. I am writing this on behalf of my friend Damselblue ... her live rock has a rounded, mound appearance and what she thought she was ordering from your company was nice open, varied structures with many caves and tunnels. The pieces she received look like what many fish stores sell as base rock - solid structures which could hold the weight of the nicer top pieces in a setup with not very much coralline or other algaes. I understand that your definition of base rock is devoid of any life. I also understand that the reason you feel her rock is looking so lifeless is due to the high salinity bath she gave it at another vendor’s advice. Did Birdfish say it looked "so lifeless" ? However, the vendor who has that advice posted on their website also sells Fiji live rock collected and shipped in the same fashion as yours, from the same area. 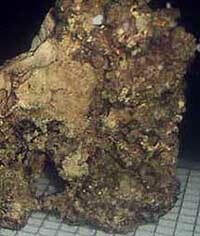 Hobbyists have posted pictures of their live rock when they first received it from this other vendor ... a month later, the rock is covered in a lot of coralline algae, teems with life and is reported to have many of the life forms which Birdfish has stated makes live rock "live." I and many other hobbyists have reassured Damselblue that in time her rock will be just as "live" as any other rock, but even with that reassurance, she simply does not like the shape of the rock she received. The majority of the dissatisfaction about the rock is in the boulder-like shapes. Thanks for your help with the communication ... sometimes another party can surely help. We understand that Damselblue is not happy with the shapes of some of her pieces of live rock. 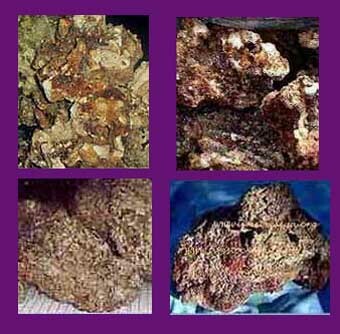 Our live rock is collected at the place of origin, and, although they do their best to include varied shapes and sizes, it can be that some boxes do not include as much variety as others do. I agree that the second piece from the right has a nice shape. The piece on the far right also looks like it may have some tunnels and more open shape, but Damselblue says that is the nice side showing and that it is a really dense, heavy, flat structure on all the other three sides. These BOULDERS are what she takes exception to and where the complaint stems from. This live rock may not be exactly what Damselblue was looking for, but it's also not quite as bad as she may be feeling it is ... actually, it may turn out to be much better than she initially feels it is. When placing her order, Damselblue stated the size of her tank and asked for your company’s opinion about which size of rocks to order for her small tank. She was recommended the box of small shapes, and that is what she purchased. Box of "small shapes" ... ? Hmmmm ... that wasn't an available option. I wonder where LadyOctopus got that information. In taking a look at Damselblue's original e-mails to us, it is clear that in her correspondence with me, that I actually talked her out of ordering a box of the Large pieces. She did tell us the size of her tank ... BUT, she kept requesting LARGE pieces. She was never told that there would be small pieces ... she was told they would be medium to medium-large and that the pieces in the Regular box would be "smaller" than the Large box she repeatedly was asking for. In other words, she was steered away from ordering the Large pieces box. And, her pieces are medium to medium-large. Original Correspondence From Damselblue: I have a couple of questions. I'm ready to order my live rock. I am going to be ordering the Ultra Fiji Premium Large Pieces ... How much nicer are the Fiji Larger pieces of LR vs. just the plain Fiji? I would like some Large pieces, but also maybe some smaller ones. Yes, this is true, when Damselblue first contacted you she wanted the box of Large pieces. She accepted your guidance on which type of box she should order and you steered her toward the REGULAR box, which she has been calling the "SMALLER PIECES" ... ... this is a problem of definitions. This amount of large boulder-like shapes are of little other use in a 40-gallon display - there simply isn’t enough room to aquascape with all of these pieces and then to buy other nicer pieces to cleverly place here & there to make it look better (this is what many hobbyists have suggested, but I don’t think they are picturing the size of display issue in her tank). She is saying she received these large, boulder-like pieces, which you are defining as the medium to medium-large pieces ... exact terms aside, there are still no photo representations of these boulder-like pieces on your Fiji page. Here are a couple of comparison photos ... Damselblue's photos are on the left and website photos are on the right ... there could be some similarities. Also, it may be that Damselblue focused on certain photos over others ... we try our best to include as many photos as possible to give a good overall picture of the variety of different types of live rock that is collected in the Fiji islands. It was made clear to Damselblue in e-mail correspondence that the "regular" Fiji has large pieces, and, as stated on our website, "large pieces are not uncommon" ... but, these were larger pieces than she expected. Sometimes, for some folks, that's a good thing, but in this case, it wasn't. Since live rock shapes vary from box to box, with each box being unique, we have tried to represent a variety of shapes and sizes on our website, but it's impossible to show them all, obviously. In any event, we are going to help her feel better about all of this. I would just like to see her understand that the term "smaller" in her mind was not meaning "small" ... it was only to be used in relation to the large pieces she was attempting to order. Let's face it ... some companies would have simply let her order the large pieces box and not give a hoot about what she was truly looking for. In our case, we tried to order to proper product for her needs. However, we have to consider her situation when making decisions about what would be a good solution, and I'm sure we'll come up with something. Things have gotten out of hand on the message board and I wish these discussions could have taken place in private e-mails. In regard to Damselblue's posts ... instead of coming to us first, she posted her complaint ... then, by her fourth post, she posted ... "I'm going to write them and tell them." It was Damselblue who chose to use the message board for discussion before contacting us directly. The issue keeps getting clouded with mud-flinging ... and this most recent attempt at getting others to doubt Damselblue's integrity are of very little use when righting a wrong. This lack of response to the root of the dissatisfaction Damselblue has expressed has been a wrong. The manner in which Damselblue has been referred to as dishonest and misleading are both unfair and untrue. "Now they are telling me that I killed everything in the rocks because of the high SG dip. They told me I should not have done that because now I killed everything." "I DO REMEMBER READING ON YOUR SITE TO DO A DIP THAT CONSISTS OF 1.030 SG! Then you took it down. I think this is c%@p. I would not make things up like this." "This guy just told me too bad." "Wish I would have known people have had trouble with them before I bought it." "... the live rock ... is all held at LAX. ... It sits there. The rock sits there. So, I don't doubt my rock sat there." But, I agree ... that WAS a lot of mud! Our only wish is that Damselblue would have taken the time to sit down and write us in the fashion that you have so we could have gone over things better with her, but that was not the case and it makes it a much harder situation. When customers come to us with problems, we are very open in our dealings with them, but she did not come to us for help and allow us time to respond. Thank you again for taking the time to write, we appreciate your efforts and we surely will send her photos over to the folks in Fiji so they understand. I understand that Birdfish feels unfairly attacked by Damselblue’s complaints. Emotions have run high on both ends here. However, I also know the value of attempting to turn a situation like this around, from dissatisfaction on the consumer’s end to gratitude that a business is willing and able to come to an agreement with the unsatisfied party to provide a product of like kind and quality which the business represents in their advertising medium. This is what I would like to see happen. This would make a world of difference in the way Damselblue is left feeling about your company and her start in this hobby. Don’t you think if an attempt to make up for the difference in quality was made, that Damselblue would tell others on The Thread and locally that this happened? This would go a long way in the eyes of many hobbyists who have read about this live rock shipment. this is certainly a bit of interesting advice!